The RAM Trucks we carry at Gupton Motors are tough and reliable, equipped for any job. That’s due in part because of what’s under the hood. When RAM was selecting a diesel engine for its pick-up trucks, RAM chose the best in the industry: Cummins Engines. Innovating since 1919, Cummins has the experience and expertise to create a legendary and dependable diesel engine. Beating the V8 engine on many levels, the Cummins Diesel Engine has an in-line six cylinder design. 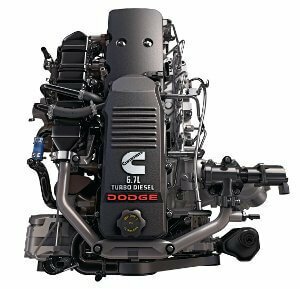 With fewer parts than the V8 and comparable displacement, Cummins offers more efficiency due to less frictional horsepower loss, which also means it’s easier to service. Cummins not only provides 96 years of experience and dependability, but has also offered a 100,000 mile warranty since 1940. The RAM 2500 and 3500 in stock at Gupton Motors are equipped with the Cummins 6.7L Turbo Diesel, offering 395 horsepower, Best-in-Class launch capability and low-end torque of 850 lbs. Both its horsepower and torque ratings are optimized for the best fuel economy. With its in-line 6 cylinder, it requires 30% fewer moving parts and boasts exceptional towing and hauling capacity. The Cummins engine not only comes standard with the most powerful integrated exhaust brake available in a heady-duty truck, but it also offers superior throttle response with the VGT Turbo Charger. You can also rest assured with its Best-in-Class 5-year/100,000-mile warranty. Intrigued by the legendary Cummins Diesel Engine? Experience its unbeatable power and rugged dependability by test driving a RAM 2500 or RAM 3500 at Gupton Motors in Springfield, Tennessee today. Contact us for more information.